But where do you start? There are a couple of guides out there, mostly online but also in print, that attempt to provide a good overview over the subject of worldbuilding and hand the reader a kind of step-by-step checklist. The AD&D Worldbuilder’s Guidebook is probably one of the most well known, but once I got the opportunity to give it a read I found it rather lacking. Yes, first you start with a globe (or other type of body), then you decide what is water and what is land, place the mountains and rivers, forests and deserts, kingdoms and towns, and so on. But unless you really have no clue at all about the creation of a new fictional world (in which case you’re probably not the main audience for such guides), these are things you all already know. The real questions are how you create a world in a way that it is exciting, unique, and has real traction, and avoid it just being generic, inconsistent, and overly exotic to the point of getting silly? Earlier this year, I stumbled upon The Kobolds Guide to Worldbuilding, and it turned out to be just the kind of book that adresses exactly these things! 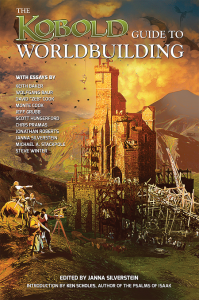 The Kobold Guide to Worldbuilding is one of the guides on game design by Kobold Press and consists of a number of articles from game designers and writers such as Keith Baker (Eberron), Wolfgang Baur, Zeb Cook (Planescape), Monte Cook, Chris Pramas, and Jeff Grubb (Spelljammer, Al-Qadim). People who know a bit or two about making successful camapaign settings). The Kobold Guide doesn’t include any charts, checklists, random tables, or (except for the article on mapping) illustrations and most definitely not a kind of textbook. It’s a group of people sharing their actual experiences in the field and explaining what they consider the reasons why some settings evolve to become truly unique marvels of writing and creativity and other ideas simply end up falling flat. To give an example, one of the first article in the book provided what is probably my most favorite quote about worldbuilding I’ve ever read. Because here Wolfgang Baur just nails down the biggest mistake, that I think worldbuilder tend to make all the time, and which, of course, I’ve been guilty of myself for a very long time: When you write a setting for an RPG, it is very easy to forget, that you are just creating the setting. You are building the stage on which the story will take place. The setting is not the story. 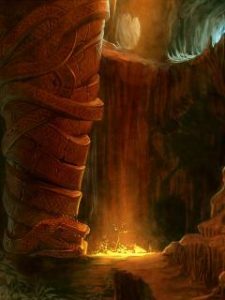 When creating a setting, you are providing the setup for a whole number of stories that will yet have to come into existance through adventures and campaigns that you are setting in it. Creating a world that is consistent is one thing, but when you create a world that is to be the background for the adventures of a group of player characters, you have to remember to adress all the things that matter to the heroes of the these stories, and that very few people would ever know about aspects of the world that are unlikely to ever come into play (mind the pun). It’s things like these that don’t tell you what things to include in your world or how to make these things, but instead help you to gain a better understanding about what you’re actually attempting to do. In a way, The Kobold Guide to Worldbuilding didn’t really tell me anything new. Half of the things that are said are things I already knew, or which I was kind of suspecting and just got confirmed by other people who are thinking the same, The other half of the book are things that I should have known all along, but never really thought of. And these parts are what makes the Guide such a wonderful book. Now I’ve been dabling in worldbuilding for almost 10 years and have been brooding over it a lot and read lots of guides and articles. Maybe to a newcommer into the field, there are actually some things in the book that you’ve never been thinking about before. But even if you consider yourself a veteran, I think this is a really great work to read. Because knowing what to do and understanding how to do it, can often be quite different things. $13 (pdf) for 105 pages of content that you’ll probably read only once might be a bit steep, but if you’re seriously pursuing worldbuilding as a hobby, I think it’s a worthy investment. Previous Previous post: What are the Ancient Lands?